The next time someone calls out your choice to add water to your whiskey, raise your tumbler in a toast and school that know-it-all on the science behind water and whiskey. Never let anyone tell you that you shouldn't add water to your whiskey. The typical reason whiskey “connoisseurs” offer against adding water to whiskey is that it dilutes the liquor, but that's not true. It can weaken the bourbon, sure, but only if you pour in too much. Diluting whiskey isn't an issue as long as you follow the science behind it—and that's no fake, Jake. It's all about the chemistry. Water and ethanol: that's the heart of this spirited magic. Two scientists from Linnaeus University proved it by studying what happens when you add water to your whiskey. Bjorn Karlsson, a computational chemist, took the lead on the study with his colleague, Ran Friedman. The two launched simulations on the computer involving alcohol and water. They programmed the simulation to include a variety of organic compounds having to do with a whiskey's flavor. What they discovered does more than change the taste of your favorite whiskey. It may also impact the future of drug delivery concerning the administration and development of liquid drugs. During the distillation process for whiskey, water usually gets added to each best. Typically, the whiskey is diluted to around 40 percent ABV, or alcohol by volume. What happens when you add more? In trying to figure out the answer to that question, Karlsson and Friedman discovered that whiskey contains a lot of amphipathic molecules, which are complicated little guys. In some regions, they repel water; in others, they attract water. Therein likes the way they affect whiskey. For this study, the researchers narrowed their focus to guaiacol, a compound found in Scotch whisky more than whiskeys distilled in Ireland or the United States. Flavor rises when you add water to your whiskey. The study revolved around guaiacol, but the results hold true with any amphipathic molecules. Guaiacol is responsible for the smoky flavor in some whiskeys, but other brands and batches contain different amphipathic molecules, and thus they have different tastes. No matter what, the dilution process changes things. Flavor rises and falls, as a matter of fact, when you add water to your whiskey. Molecules attracted to the water will rise, while molecules that are repelled by water end up at the bottom of the glass and the end of the swallow. The level of dilution matters, as well. 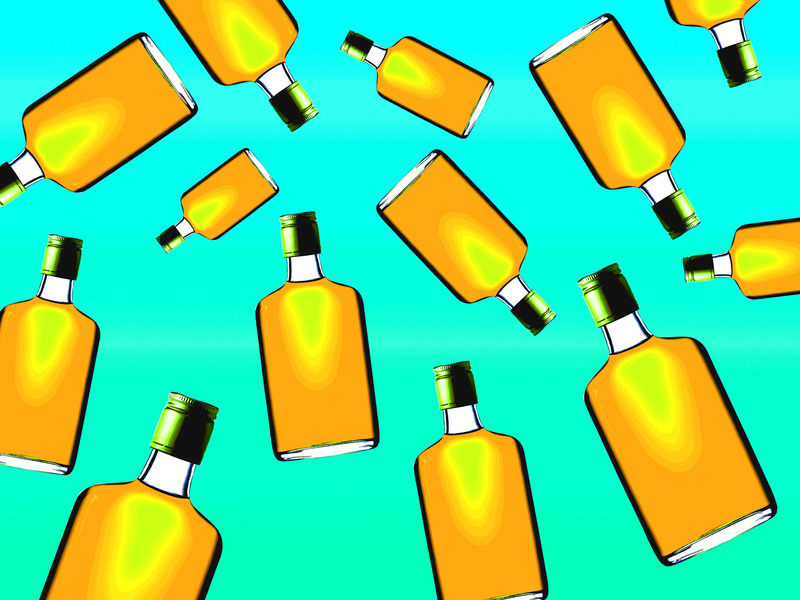 Karlsson and Friedman found that in whiskeys with an ABV higher than 59 percent, the guaiacol molecules avoided the surface—were nearly driven away, in fact. On the other hand, at 45 percent ABV, the guaiacol molecules linger near the surface. For the most part, the process of diluting whiskey takes place before bottling. Much of it has been done long before you pour the amber liquid into a tumbler. Fortunately, even then, you still have some control over the alcohol concentrations. Adding a little water won't hurt. Even whiskey enthusiasts advocate the addition of a little H2O. Moderation is the key, and a steady hand doesn't hurt, either. No matter what type of whiskey you drink and what flavor profile you're after, adding water is more than a science. It's an art form. You can only add a few drops at a time. Learning how much water to add takes practice, but remember this: you can always add a few drops more, but you can't take out what you've already put in the glass. In other words, better too little than too much. Even a little water changes the entire flavor of your drink. The reaction between water and alcohol is powerful enough that a few drops make all the difference. Should you have the time and the stamina, you could create endless flavor profiles for every brand of whiskey on the market and never run out of combinations. The kind of water you use has an impact, as well. Play around with the water molecules and the amphipathic molecules long enough, and you can come up with a signature sipping whiskey. Hot whiskey has a unique appeal, often reserved for serious sippers. Spicy notes come to the fore. Your tongue is likely to tingle with the bite of cloves. Hotter spices tickle the palate. They'll probably clear your sinuses, too. To keep those tastes, don't add too much water, obviously leave out the ice, and make sure that the water is at least lukewarm. To get grassy notes, you need to add a little more water to hot whiskey. The water molecules coax out the oils in the booze. Sip it first. Neutralize any spice with a few drops of water, but mind that you don't dilute the fresh, green flavor. Adding water to hot whiskey can also bring out a buttery flavor. It's a hint, quite subtle, but it's unmistakable. You'll usually find it in heavier, older spirits. Incorporate the water drop by drop and, again, it shouldn't be any hotter than lukewarm. Not only can you add water to your whiskey, but you can also control the temperature. Scotch on the rocks is a popular cocktail, and one of the basic whiskey cocktails you should know, and you know that water is an acceptable addition to your spirits, but ice isn't ideal. It isn't measured. There's no consistency, and it's far too easy to water down your drink. Drink stones are the better bet to cool down your beverage, and they also make for great gifts for whiskey lovers. Add water to your whiskey to enhance its smell. The tactic is a favorite one among whiskey connoisseurs. With the right balance, you get a punch in the nose every time you raise the glass. These are the spirits you want to savor. One more thing: when you add water to your whiskey, it reacts with ethanol and forces the flavor to the surface, the potency comes along for the ride. In cases where the alcohol rises to the top, your first few sips—or gulps—are intensely powerful. Of course, that's on the condition that you don't add too much water to your whiskey. During your next philosophical discussion at the bar, provide facts to back up your decision to add water to your whiskey. You know the best way to drink whiskey like a pro. You've got science behind you. You're good.